You may argue, “What is in a name? That which we call a rose, By any other name, would smell as sweet.” I agree. But if you don’t know, what does any name mean, how you will explain any name (rose minus name) to anyone. Suppose, I ask you to stop wearing Méiguī tinted glasses, how would you respond if you don’t know Méiguī means a rose in Chinese. There is something beautiful about the names. Shakespeare knew this fact and even if he denies, in that very line, he has named many of his characters very carefully. Read some of his plays again and explore how he has named all his characters. And that’s what motivated me to continue the Name series. In this continuation, you will learn about Different names of Mahabharata characters and what do they mean. Today, I am going to start with the eldest Pandu son, Yuddhisthira. The name Yudhishthira is derived from two Sanskrit words, Yuddha which means “war” and Sthira which means “steady”, giving meaning to the name, “the one who is steady in the war”. Yudhishthira is also known as Dharmaraja which means being the upholder of the dharma and never deviating from the truth. Though many believe the sobriquet was given to him as he was the child of Dharma (Yama) but that is not true. Yudhishthira is described as strong but humble like any other citizen, wearing the smile on his face and kind toward all beings (even his enemies), thus he became to be known as one who have no enemies, Ajatashatru. During the thirteenth year of the exile, Yudhishthira assumed the identity of a Brahmin and adopted the name Kank, and along with Karna, Bhima, and Arjuna, Yudhisthira is known as Kaunteya. But Yudhishthira has at least one mortal enemy. That was Duryodhona. 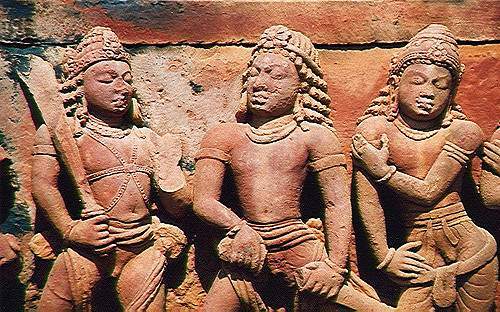 Among all Pandavas, Yudhisthira was least expert in martial art. It is a relative term used against likes of Karna, Arjuna, Bheema, Duryodhana, Bhisma, Drona, etc. Please share a post with different names of Arjuna.